Betty Duke was born in the early 1920s, the youngest of five. Her and her sisters, Ethel, Kitty, Daisy and Olive, grew up in the quiet county town of Hertford. Their parents, Alice and Joseph, were simple, plain, undemonstrative Baptists. They were good, hard working people. The family lived in Cromwell Road, in a neat semi-detached that came complete with all the latest mod cons. At least, they were when the house was built. Outside toilet, gaslights and a tin bath in front of the fire. To our modern eyes these may appear, at first, a trifle arcane, but for the time they were a vast improvement on the norm. Next door, lived the Timpson family. Mrs. Jinny Timpson was Joe’s sister and was married to John. They had three children, Bernard, Ronald and Joan. Little Betty would spend as much time as possible with her boy, cousin Bernard. The two were to be almost inseparable until just before Betty started school when they moved to a nearby town. Betty would, later, spend many happy holidays there. The move was brought about by Uncle John’s change of job. He secured a position with the Metropolitan Water Board as a water bailiff. His duties, among others, would include keeping a general eye on a section of the river Lea, cutting down excess waterweed and such tasks. His remit also covered the nearby reservoir. He and Mr. Carter, the other bailiff, divided the work and the time equally so that comprehensive cover was maintained. 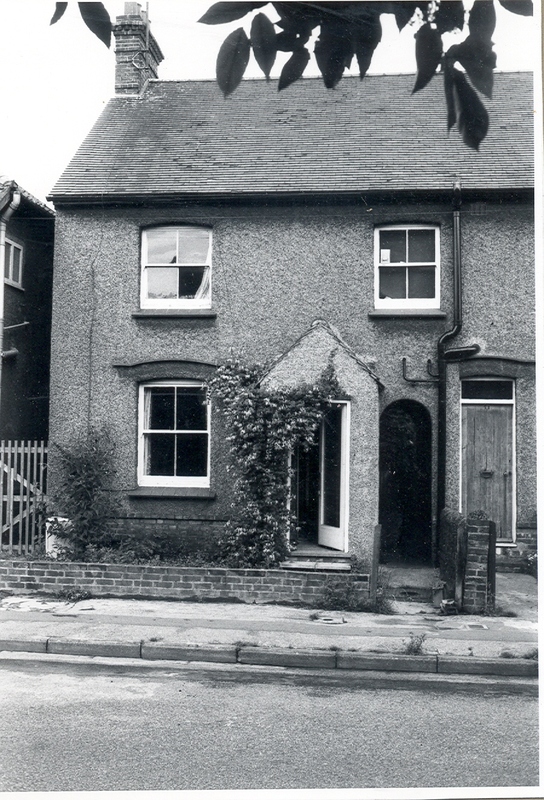 Both men lived in adjoining cottages, on the outskirts of the quiet Hertfordshire town of Cheshunt. The cottages, being tied to the job, were one of the first in the area to have the telephone installed, although STRICTLY business only. For example, if a large clump of loose weed was seen to be floating toward their patch, the ‘phone would ring and John would take steps to avoid a potential river blockage. If he were already out on the riverbank, Aunt Jinny would go into the back garden and shout ‘BELL’. Jinny had very good lungs and on a quiet day could be heard several miles away. It must be remembered here that the world then was largely devoid of noise pollution. No lorries, planes, motorways. Road traffic was mostly horse drawn, a much quieter place altogether. With the exception of Aunty that is. During the year, Aunt Jinny would supplement the family income by cooking mid-day lunches for the fishermen who would come from miles away to fish the river and the reservoir. Roast lamb was always a great favourite with the men, and they would willingly pay the reasonable prices Jinny would charge. The quality of the meals was such that the men would fish these waters as much for the lunch as for the fishing. This is even more remarkable when the cottages themselves were taken into consideration. Two rooms upstairs and two rooms down. Including the kitchen. Gaslights and a coal fired cooking range. For those who have never seen one of these, imagine a large, cast iron box the size of a large chest freezer. Now imagine that at one end was the coal fire, and at the other was the chimney. The heat from the fire would circulate inside to warm the hot plates and the oven. The oven temperature was controlled by the size of the fire and the setting of the flue. The flue was a flap arrangement that closed or opened the chimney. By juggling the two it was possible, with a great deal of skill, to accurately set the oven temperature. A fine piece of cooking could be ruined by a sudden draught or the slamming of a door. Betty now wonders what the average woman of today would make of those working and cooking conditions. Other holidays were spent with another of Alice’s sisters, Aunt Sissy. Sissy lived in the Mid Norfolk town of Aylsham which was then deeply rural. It is fair to say that the people then had very a strict and also deeply rural caste of mind. Betty did not enjoy these one-week holidays at all. Sissy was a very domineering woman, especially to children. Betty found that the least mistake earned her the punishment of being made to sit on a wooden stool in the corner of the kitchen, where she had to hand sew an iron holder. This was a square of cloth, four layers thick, that was used to hold the handle of a flat iron. For those who don’t know, a flat iron was the forerunner of the modern electric iron. It was made of, guesses what, cast iron and was heated by standing it in the fire or over a gas stove. As you can imagine, the metal handle became uncomfortably hot, hence the cloth squares that little Betty would sew with neat stitches round all four sides. Aunt Sissy would inspect the finished article and if one stitch were out of place, with scissors flashing, she would rip the whole thing apart and Betty would have to start again. Aunt Sissy had moved from the family home in the next village along. The village is called Blichling. Her sister, Alice, was born in a house on the Blichling Hall estate. The estate was the countryseat of His Lordship and had, over time, been host to Royalty. Her father, John Howes, was the coachman / gardener and he lived in a tied house with his wife Hannah and their children, Alice, Sissy, Ethel, Sid, Herbert and Ernie. Most local people worked ‘for his lordship’ and the Howes family were no exception. Aunt Sissy worked in the office, Uncle Sid worked on the farm and Uncles Herbert and Ernie had gone into service and had, over the years, risen to the rank of ‘Gentleman’s Gentleman’ or butler, as we would now call them. Both men had taken prestigious jobs in London. Alice had entered service much later than was usual. When she was in her early teens, she became badly anaemic. His Lordship was fairly enlightened for his day and allowed Alice to spend sunny days sitting in the beautiful gardens that surrounded the house. Because of this Alice did not start work at the usual fourteen years of age, she was closer to eighteen when she finally left home. There being no jobs open to her at the hall, Alice attained a position in a large house in Harlow. She started, as was normal, as a kitchen maid. This was the lowest post of all and was more widely known as ‘the skivvy’. Her duties included helping cook or the housemaid, getting up before dawn to clean, lay and light the household fires, and anything that was considered beneath anyone else. Although a hard life, it was a fair one. As the servants existed only to make the noble family’s life bearable, their standards had to be high. Everyone started at the bottom and rose to the position that they were best equipped to fill. So it was that Alice rose through the ranks to the position of parlour maid. This job involved actual contact with the family themselves. Dim, scruffy people need not apply. In that household, Alice rose to be children’s nanny; unfortunately the only way is either up or out. When the children no longer needed a nanny, Alice was released. So it was that she took a place as parlour maid at Vale House in Hertford. This is where she met Joseph Duke. Joe Duke was a woodworker by inclination. Indeed, after leaving school and doing his apprenticeship, Joe had started and ran a small business that specialised in ornate fretwork picture frames. When the market trends moved away from this product, Joe went to work for a Hertford company called Norris. They were then, and until quite recently, builders and decorators. Joe soon became one of their top men, specialising in interior painting and wallpapering and undertook most of the prestigious jobs, travelling to houses all over the country. Over time, Joe had done quite a lot of work in Vale House. He had become victim of a severe bout of what was then known as ‘Enteric fever’. This, being a form of typhoid, had left his not too tall frame thin and run down. Joe, by this time, had become friendly with the cook who insisted that he needed feeding up. It was at one of these meals that Joe and Alice met. Because of Joe’s family situation, their courtship lasted for ten years. They eventually married when they were in their mid thirties. Joe had grown up in Hertford as the son of Joseph and Emily Duke. Joseph was, by day, assistant to an undertaker. To augment his meagre pay, he would play the violin in most of the local pubs during the evenings. Joe, with his brother William and his sister Jinny, was rather frightened of his father. Not that his father was overly physical, quite the reverse. It was a combination of the dour, reserved Baptist demeanour and the simple fact that Joseph, in his black, undertaker’s clothes, was a very intimidating sight. The family, not unlike a vast number of similar families, had suffered the multiple tragedies of several infant deaths. Emily had lost several babies while they were still very young, including two sets of twins. Most had died from convulsions which was one of the most common causes of infant mortality in the late eighteen hundreds. Grandma Emily also had another cross to bear. When her children were still small, she scratched her arm on something. Today, not a thing to even mention. Back then though it was a completely different story. The scratch went septic, this turned into blood poisoning and the end result was that Emily had to have her arm amputated. All this was stoically endured, as was the norm. It is perhaps difficult today to appreciate the quality of the ordinary man’s life in those days. No welfare state, no National Health Service and nobody cared very much about anyone’s fate who was not, at least, middle class. So it was, one night, that Joseph was found slumped on the pavement outside a pub in which he had just been playing the violin. A verdict of ‘Heart failure’ was given and that was, officially, that. It was strange, however, that neither Joseph’s violin or his money were ever seen again. Life was cheap and hard in those days. Very few had money, most went hungry. People would do almost anything to gain even temporary respite. To call Emily brave would be to suggest that she had any options. What she DID have were young children, one arm and no breadwinner. Emily took a job in the local laundry doing ironing. Indeed, she held this position for a good many years and when Joe finally went to work, his wages saved the day. Joe continued to help support his family for many years. At last, his family conditions changed and his ten-year engagement to Alice was finally at an end. They got married in nineteen twelve. Three days before the Titanic sank. Like many other men, Joe fought in the First World War. Like many other men, he would seldom talk of his experiences. Modern history shows us the full horror of that type of warfare. Even now, it fills us with terror and dread. No, men like Joe seldom spoke of what they had seen. Some time later, they were to be blessed with their first daughter, Ethel. Alice had not had an easy pregnancy and Joe requested compassionate leave to be with her at the birth. He was to be posted to north Russia and the army granted his request. That is how Joe saw his first child born, it is also how his life was spared. He later found out that the troop ship that he would have been on, had been sunk with heavy loss of life. This was not the only occasion that Joe’s life was saved by a quirk of fate. Toward the end of the war, Joe was to be shipped over to France. The army then was never the most organised service; often, men would be transferred somewhere quite different to where they thought they were bound. This sometimes happened at the last minute so nobody knew anything. So it was with Joe. His section was diverted to north Russia. When the soldiers never arrived in France, checks were made. It was found that the ship that Joe would have been on was sunk with the loss of most of the souls aboard. The information that Joe was never on the boat never got to the right person and as a result Alice was told that her husband was listed as officially ‘missing’. This meant that for six months she not only thought herself a widow, but also received no money, as Joe’s wages were stopped the instant he was missed. They say that you can tell your worth by the quality of your friends. A friend of Alice’s was the proprietor of a grocer’s shop called Howard Roberts. Alice was extended credit and both she and the girls lived on this for quite some time. Alice’s health was never robust, but despite this, she took a job in the laundry that was virtually next door to her home. Alice persisted, and after repeated enquiries, the army finally found Joe. When his back pay came through, Alice went straight to the shop and paid her bill. Joe had been found in Russia, fighting with the forces of the Tsar against the revolutionary uprising. He would not return home until 1920. During the later part of the war, Alice had two soldiers billeted on her. The billeting sergeant would march them around, dropping off one or two here and there. Alice became quite fond of her two, she had always wanted a son and she would mother them, loving every minute of it. The soldiers would only sleep there, if food was in order, they would bring their own. Eventually, Joe came home and life returned to a new kind of normality. Four more years would see their family grow to four fine girls. A gap of a further four years ensued before Alice fell pregnant again. The time eventually came, and the doctor was sent for. Alice gave birth to her fifth child at home, where she had indeed had all of her others. Eventually the doctor called Joe in from the garden and announced, “Well Mr Duke, you have a fine daughter.” Joe looked at him and just said, “Another damned girl,” and went back into the garden. So it was. With her older sisters already at school, Betty (her christened name, by the way) spent her early years pretty much being left to her own devices. As she grew a little older, she would ‘help’ with the cooking. A corner of the kitchen table, a little pastry, the usual. When she grew older, she would actually do some of the minor housework. And, weather permitting, play in the garden. Betty would spend a lot of time kneeling on a chair, gazing out of the back window. The rear of the house looked out upon a fascinating view. The garden came first, next were the large allotments. On the other side of these was a vast expanse of field that went all the way over to the river Lee. This area was known locally as ‘The meads’. Half way across this expanse ran a man-made canal. This fascinated Betty. During the summer, she would watch the barges being pulled by horses. These went to and from London and Betty sometimes wondered what they were carrying. Summertime also filled the area with wild life and flowers by the million. During winter, the snow would turn the view into a child’s wonderland. Large, white mushrooms that looked as if they must be the homes of elves were, in fact, only common cabbages. One vivid memory Betty has is of her and her sisters walking up Gallows Hill. That winter had seen heavy snow, the girls walked between high drifts that towered over little Betty. The drifts were taller, even, that her sisters. Betty remembers her first day at school. Ethel took her to the school gate, dressed as she was in her blue jumper with the two bobbles at the throat, and just pushed her through. When Betty turned round, she found that her sister had already left her. She stood there for quite a time, feeling rather frightened, surrounded by a sea of strange faces. She felt very, very lonely. The sound of a piano broke her mood and with the loneliness fading, she marched into the school along with the other children. Betty would find out later that the piano-playing teachers’ name was Miss Law and after every break, the children would have to march smartly into classes to the music. Betty found that her time in this school was not very memorable. One thing sticks out in her mind, however, Christmas. This particular year a small party had been laid on and a notable townswoman was present. The Faudell-Phillips family lived in a very large house, deep in the best part of Hertford. Mrs. Faudell-Phillips mingled with the children, dressed as Queen Elizabeth the First. Betty can still visualise her dress with its large, gold lame` collar. Christmas at home was always a wonderful time. Alice and Joe would spare no effort to make it a special time, a time to remember. Toys, treats, the tree complete with decorations, a short holiday but a happy one. Always included in the tree trimmings were pink, sugar mice. One of Betty’s favourites. Alice would start her Christmas cooking in November. She would make sweet mincemeats, Christmas puddings, and a Christmas cake. It is worth noting here that the ready prepared ingredients that we take for granted now did not exist then. All the fruits had to be done by hand. Once again, Betty’s hand. The raisins, for example, had to be individually pipped. Betty would sit for hours pushing them out. She would have a finger bowl by her side as the process made her fingers very sticky indeed. Some people left the pips in, but as Alice and Joe both had false teeth, Betty’s work continued. All through this preparation, Betty was placed on her honour not to eat any of the fruit. And indeed she didn’t, at least not when anyone was looking. The November ritual of stirring the Christmas pudding mix was a family occasion. Each would give the mixture a stir while making their own secret Christmas wish. Bedtime on Christmas Eve would see the girls hang up their stockings. They were stockings back then, not the jumbo pillowcases that now seem to be the fashion. They would be filled with small items. Usually there would be three brand new pennies in the toe, on top of which were an apple and an orange. The rest would be novelties and small toys. The toys then were made of tin plate and had plenty of sharp edges. But back then, who cared? There would be very few presents, but the ones they did get were nice. All except for Aunt Sissy’s. She made all of her own presents, so it is easy to imagine how Betty’s face fell when the wrapping revealed an iron holder. Three p.m. came and the family would gather around the wireless set to listen to the King’s speech. The house only having gas, the set worked from an accumulator. A sort of small car type battery. The local bicycle shop would charge sixpence to replace the flat one with one that was fully charged. Christmas day teatime the family, and any relations that would visit, sat down to a splendid feast of ham, tongue, fruit, cakes, jellies all of which had been prepared at home. Crackers would be pulled and the indoor fireworks that were inside would be lit. Most were relatively harmless, black trees growing, brown snakes writhing and the like. But there was one that was called a snowstorm. A few seconds after lighting, the room and everyone in it, would be covered with white dust. Clouds and clouds of white dust. After tea, everyone would go into the sitting room. This was one of the few occasions that the girls would be allowed into this hallowed area. It was a common practice of the time that the ‘best’ room was only used on the ‘best’ days. Carols were sung and each person’s favourite had its turn. Sometimes Joe would play his concertina while the family danced. In his youth, Joe had been an excellent dancer and at sometime during the evening, he would get up and do the ‘step dance’. The others would look on, not joining in. This was for two reasons. First Joe was so good, and second he was the only one who could do it. As the evening progressed, someone would suggest playing cards. They would play games such as rummy or speculation, usually for pennies. It was the coppers that complicated things somewhat. Alice would sit with her most imperious, stern look. Nobody dared to question her. The older aunties would get most upset when they didn’t win, mainly because they were cheating like mad all the time. Alice, of course, would cheat as well; it was just that she would cheat a lot more than most. She would drop cards on the floor, lay two instead of one. Her regal look insured that she was seldom, if ever, challenged. Suppertime came at nine thirty. There was always pork pie, cheese and cut meats. Yes, Betty remembers, Joe and Alice always made the effort at Christmas time, although they usually took half a year in saving up to pay for it. Boxing Day would usually be spent next door with Aunt Jinny and family. Many happy hours passed for all. The twenty seventh, however, meant back to work. Christmas then was only a two-day holiday, not the two weeks we now expect. Betty’s time in the infants’ school passed by uneventfully until, in due course, at the age of seven, she went on to the juniors. She was now a pupil at the Abel Smith junior school. The head master was a very tall, military-looking man. Betty was not surprised to find that his name was Major Upton. Betty found that her favourite lesson was physical exercise. In particular she liked running; in fact she liked almost exclusively running. One lesson, she remembers, her teacher told her to do some jumping. Betty didn’t want to, and said so. The teacher ordered her to do it anyway. Needless to say, Betty fell and badly sprained her right arm. Teacher took her to the doctor who strapped her arm up in cotton wool, Betty was then quietly taken home. By this time she was running for the school, so no mention of jumping occurred again. After school Betty would team up with two of her close friends. Normally they would just explore the town and surrounding area. Their names were Mable Clark and, ironically, Ruby Welch. Little did Betty know that, later in life, she would marry a totally unrelated man named Ray Welch. Hertford is an old, old town. It has all the usual things that one would expect to find. A golf course, the town centre, the river Lee and a castle. In the grounds of Hertford castle is a large mound, quite steep and grassy. The girls liked to climb to the tree-covered top where the view was good enough to make them feel great. Betty has always enjoyed a good view, and one of the best came once a month. She was, by now, attending All Saints church Sunday school. One Sunday a month the class would be held in the church itself. After lessons the children would be allowed to climb the narrow, winding stairs that led to the top of the tower. Through the little wooden door and Betty stood for as long as possible taking in a view that stretched for many miles. Things like these may, now, seem insignificant. But to a child such as Betty, growing up in a very different world, these were memories that are still treasured. At the age of eleven, Betty went up to the senior school. Her headmaster’s name was Mr. Honeyball. Although a small man, he had a voice that could put the fear of God into anyone. He seemed to delight in catching out the unwary. He would leave the class he was teaching, walk round the corner and, standing on a ledge, look through the window. Any unattended class will mess around; he made sure that the names were taken. Mr. Honeyball caught out many children in this way. Thinking back, Betty realises that the threat of discipline was used more that the actual action. She remembers being one of four girls that had been left alone in a classroom. They were happily running OVER the desks when they were caught. All four were sent to the head, great fear, no action. It was about now that Betty took up running and P.E. seriously. Indeed, later she would be one of six that demonstrated the latest school exercises to a symposium of teachers from various local schools. As part of the school running team, Betty would often participate in events. These were usually held, on a weekday, in the sports ground of the Allen and Hanbury’s food factory in the next town of Ware. Occasionally, however, this facility was in use so the event was staged on Hartham field. This was not only a sports ground, once a year the county fair would be held there. Betty found that she was winning quite often. Her team usually won the shield. Two other members of the team that stand out in memory were Anita Ginn and Marjorie Cook. Both were superb athletes and it was generally agreed that there was no practical difference in performance between the three of them. It was during this period that Betty was chosen to represent the Longmore School in the county athletic championships. She was entered in the one hundred yards sprint. After a good start, Betty opened a lead. She had covered about thirty yards when her running shoe lace broke and threw her. As there were some serious talent scouts present, Betty’s disappointment was severe. Indeed, even today, over half a century later, it still smarts. The good win that she knew she was on to would have, undoubtedly, attracted attention and the chance of better things. Oh well! Following the musical streak that ran, to varying depths, through her family, Betty was also a member of the school choir. She found that this was practically the only thing, apart from running, that she enjoyed. She remembers going to a choir contest in Ware and singing ‘The camels are coming’. She recalls that they never won. Her school life was not all athletics though; there was also the usual curriculum to follow. She would learn cookery one term followed by housewifery the next. Betty was not fond of this subject; it included how to clean properly, how to clean cutlery and kitchen equipment and looking after flat irons. The next term they were taught laundry. Washing, making and using starch were among the essential subjects a girl HAD to know in those days. All these were taught by Miss Wynn. She was a rosy faced, typical cook. Always nice but on the rare occasions that she got angry, she would bang the table with her rolling pin. And so Betty’s schooling came to an end. The world, then, was more interested in fitting young people to ‘their proper place’ in life, education being secondary. So, like most girls of her era, it is hardly surprising that Betty did not exactly shine academically. Also, by her own admission, she was more interested in running than in her lessons. Just after her fourteenth birthday, Betty was spoken to by one of her teachers, a Mr. Reid. He told her that he had arranged a job for her and that she would start on the following Monday. Hertford boasted a large department store called Neal’s Bon Marche. It was typical of its kind, hierarchical and riddled with snobbishness. Shop work has always been a low paying industry, position being one of the few tangible rewards. The higher workers regarded themselves as better that those beneath them, and made their feelings known. This was taken to lengths that meant young, new workers would not even be able to speak to ‘their betters’. It was this world that Betty found herself entering the next Monday morning. She had been told to arrive before nine a.m. At eight forty five, she went down the side alley and into the staff entrance. The manager, a Mr. Atty, always stood at the counter nearest the door, reading his newspaper until the store opened. He just looked at Betty and said, “Go upstairs and take off your coat”, and went back to his paper. Betty found that the older staff mostly ignored the younger ones, only talking to them to give orders. As in most trades, the new workers were set to clearing up. The customers were ALWAYS dealt with by the more experienced staff. If a lady were to ask for an item of underwear, for example, the appropriate drawer would be fetched and emptied onto the counter. The saleslady would then assist the customer to select the purchase. While the bill was being paid, Betty would have to properly re-fold the garments and replace them, in order of colour and size, in the drawer. She would then return the drawer and clear up any mess made. She then went back to her primary task of price tagging. Price tags came in an assortment of types. Sale goods had paper ones sewed onto the article by hand, Betty’s hand that is. Every type of garment had it’s own peculiar price tag. Some had a metal tag that had to be bent into shape, others had the more conventional string. All sale goods had a red tag. As the store held two sales a year, January and July, this meant an awful lot of sewing. The storefront had many windows, each was dedicated to it’s own type of product. The side window was given to the display of baby clothes and associated things. The next window, round at the front, had ladies gowns and coats. The next, ladies underwear and the like. Then came millinery, with gloves and scarves. The last two were dedicated to drapery, cloth, sheets and towels etc. These displays were changed on a reasonably regular basis, the people responsible for this operation were known as window dressers. The display to be changed, the colour scheme and which dresser, were selected by the manageress. She was Mrs. Atty, the wife of the manager. After a while, Betty became experienced enough to assist the dressers. Again, fetching and carrying, clearing up and cleaning the glass were her main duties. She learned colour co-ordination and the basics of window dressing itself. Betty found herself liking this aspect of the job. Before a trainee would be let loose on a window of their own, they had to become proficient at ‘The Tables’. In an upstairs position, the store had a showroom. Dotted around the place were display tables. These were not unlike high quality dinning tables and each supported a display of various types of clothing, accessories etc. If she were happy with the trainee’s progress, Mrs. Atty would simply say, “Have a go at that table, would you?” From these they would progress, eventually, to the windows themselves. Betty found that her athletic background came in handy in an unexpected way. The hours that she normally worked were long. Monday, Tuesday and Wednesday, she would start at nine a.m. and continue until six p.m. Thursday, however, was half-day closing, and Betty would work from nine until one p.m. Friday and Saturday were the longest. Starting at nine a.m. she would work until eight at night. If things were hectic, she would often go all day without any break other than the one-hour lunch period. All this, plus standing and running up and down stairs all day, made for a very tired Betty indeed. For this service, she was paid the sum of seven shillings and sixpence a week, that is thirty-seven and a half pence in new money. After eighteen months, her wages went UP to ten shillings a week, fifty new pence. As has been said, shop work has always been poorly paid. If Betty had been one of her family’s older children, she would have been expected to get a much better job. As the youngest of five, her monetary input to the family coffers was not quite as important as it might have been. Christmas in the shop, although unbelievably busy, was a time that Betty enjoyed. The store was always decorated with hand-made crepe paper garlands. Mr. and Mrs. Atty would decide the colours that were to be used, and the staff would take great pride in their displays. The toy department provided an old man who dressed as Father Christmas. He would have to stand outside, in the street, in all weathers, dispensing small gifts to passing little ones. These presents were kept by his side in two large boxes. The trainees would, on top of everything else, be expected to wrap a constant supply of them and keep his boxes filled. Some days, Betty was so busy that she not only never got a break; she didn’t even get a cup of tea all day. Betty would find that the lead-up to Christmas was more exiting and memorable than the holiday itself. With all the hustle and bustle and everyone in festive mood, she found that, when she finished on Christmas Eve, she went home with an almost anti-climactic feeling. The usual two-day break and back to work. Back to work meant another hectic rush. This time to clear all the Christmas stock to make way for the January sale goods. All the tables and windows would also have to be changed. Sale time was always a very busy one, with very many bargains. Betty recalls that a good quality, ladies vest would be sold for one shilling. Likewise, a corset for the same price. One shilling, by the way, is five new pence. Looking at today’s prices, it is hard to believe that those days, and prices, ever existed. By the end of February, the sale goods were removed. Ordinary trading then took place until March when the spring range would be put on display. Again, all this had to be priced. Good quality coats and suits were always in demand. A two-piece ladies suit sold for thirty-two shillings and eleven pence, that’s one pound sixty four new. A silk dress cost twelve and eleven, sixty-four pence, and a good jumper went for five and eleven, that is just twenty-nine pence. About this time, ladies started to buy the absolute essential item, a new Easter hat. The two-day Easter holiday was a mixed affair. Good Friday was a sombre time, usually spent in church. Easter Sunday was quite an event for a child. Betty would wake up to her Easter eggs, being careful not to spoil her appetite by eating too much chocolate. The reason was simple, the special Easter breakfast. Alice would cook a joint of gammon which would be served with fried eggs and thick bread. After breakfast was over, everyone would change into their Easter clothes. There would be new hats or new frocks that Alice had made. The family was now ready for the special Easter Sunday service at the Baptist chapel. Easter Monday, however, Betty would spend with friends. They normally took a day trip of some kind, either to London or a stately home. Sometimes they would just go for a day’s ramble in the beautiful Hertfordshire countryside. After Easter had gone, the store would continue until the July sale. Betty remembers that during one such, she showed an elderly lady to the changing room. She left the lady with the dress that had been selected and returned to the shop floor. After a time, Betty returned to the room to find the lady standing stark naked. Naked, that is, except for her hat. Rather flustered by this Betty fled the scene and reported the occurrence to Mrs. Atty. “Don’t worry dear, I’ll deal with it,” she said, and sent Betty back to the counter. She found that shop life was built upon a yearly cycle. The wind up to Christmas, then start all over again. 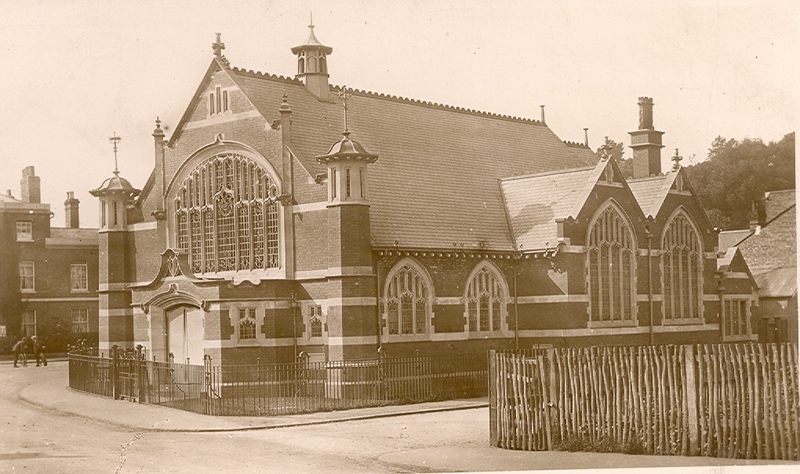 In her private life, Betty found that the Hertford Baptist chapel served her well. Apart from the Christian endeavour, or youth club as we would now call it, she taught Sunday school. The classes were arranged into rough age groups. Youngest were the toddlers. This class would now be known as a crèche, as it gave the parents of the little ones a few short hours to themselves. Next came the beginners, then the class that Betty taught, the young ones. These were aged from five to seven. All these had their classes in small rooms at the rear of the church. The older children were taught in the large church hall. At ten a.m. on a Sunday morning, Betty would oversee her little flock, taking them for singing, bible stories and drawing. Eleven a.m. came and they would all troop into the church proper for the service. She found the congregation very friendly; this was not a staid affair but one with a happy atmosphere. Betty would then take her place in the choir, an activity that she really enjoyed. On Tuesday evenings at about seven p.m. there would be a general meeting in the church hall. After a period of private talking, anyone with a point to make would stand up and put their ideas forward. These could be on any topic. Points of morality raised by the bible, or just a discussion of a topic of the day. To our ears, this may sound a trifle mundane, but in a world largely devoid of radio and t.v. these sessions were a friendly, pleasant time. Everyone made their own amusement then. With none of the modern mass entertainments, people had their own way of life. They had their own priorities, different things appealed to different people. The standardisation we are used to today did not exist then. Betty also learnt the art of public debate. At last, she was able to throw off the bonds of being the youngest of a family. Wednesday evening, Betty would, along with the other teachers, meet with the head of the Sunday school. Here, they would sort out the various lessons for next weeks school so that the children not only understood what they had learned, but why it was important. Thursday, Betty kept for going out to the cinema with friends. Sometimes she would go out with her mother, a bus ride perhaps, or a walk around the town with tea and ice cream. On Friday, she would finish work at eight p.m. or so and go straight to choir practice. With Friday being a hectic day at work, Betty often found that her first meal after breakfast was at ten p.m. But their peaceful, happy time was about to be blown to the four corners of the earth. They could have no conception of what was to lie in front of them. It was Sunday the third of September 1939, Betty and the children had filed into the church as usual. Half way through the opening hymn, the minister came in from the vestry, entered the pulpit and stopped the service. In a grave voice he announced that he had just heard on the vestry radio that Britain was now at war with Germany. The stunned congregation said prayers for peace and a speedy end and the service was resumed. On Monday, back at work, the war was, of course, the main topic of discussion. Some vaguely remembered the first war, but most were too inexperienced in such matters to comment. Life went on reasonably normally. At least for a time. It was now 1940 and Betty only slowly became aware of the war. A quiet country town is never at the cutting edge. When busses filled with patients from the hospitals further away started to roll through town on a regular basis, Betty started to take notice. She noticed that the food shops were nearly empty. Rationing came into play and almost overnight a whole way of life disappeared. The number of men dwindled as the armed forces recruited. Ordinary people would leave their normal jobs to go and do war work. One week night, Betty, Daisy and a friend were in the Castle cinema watching a rather good film. There was one particular part that Betty had enjoyed. “ Let’s see it again,” she said to her companions. They readily agreed and, as was permitted in those days, sat through the show again. They had seen about half of the film when there came an enormous bang. The cinema doors swung to and fro madly. The girls instantly knew that something serious had occurred and left immediately. They began their walk home and had about half a mile to go when they were stopped by a warden. He told them that a German bomb had landed, exploded and the resultant damage meant that they would have to walk on the other side of the road. They did so. After fifty yards or so, they saw something that would change their lives forever. They were later told that a land mine had fallen. This is a high explosive device that is dropped by parachute. Being magnetic it is attracted to anything metal. This one was probably intended for the gas works, but fate caused the wind to blow it off course. 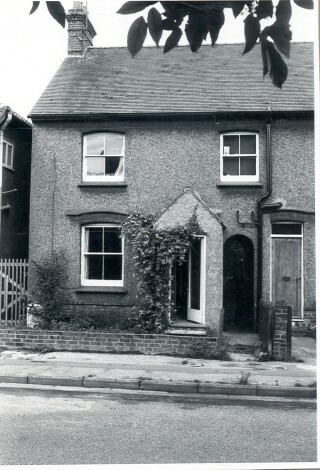 On the Ware road, there was a largish house called ‘ The Laurels’. In the front garden had stood a large, metal air raid siren on top of a large metal pole. It was to this that the bomb had been attracted. The explosion destroyed about twelve houses, chopping them off at the first floor level. It looked, to Betty, as if a giant had taken a carving knife and just cut off the bedrooms. It was a very frightened Betty and Daisy that turned the corner into their Cromwell road. “ The sweet shop’s still standing,” Betty said, hoping. After a few more yards, they saw that their road had been untouched. They arrived home to see their mother peering through the letterbox. It turned out that Alice had heard the plane and had looked out of the front door. She was in time to see the parachute and bomb being lit by the following searchlights. The explosion had blown her across the hall. Joe had told her to close the door, but curiosity had compelled her to still watch. Later they found out that three people had been killed, and many had been injured. This incident brought it all home to Betty. Overnight, her happy, secure life had been turned upside down and shattered. When people that she had known all of her life were quite suddenly dead or badly wounded, it made her wonder what they were all in for. It made her do more that think, it brought the full horror of the reality of war home to her. It was at this time that Betty’s thoughts turned to the subject of war work. Aunt Jinny had long since moved out of the house next door. In her place, lived Mrs. Shepherd. It was during a conversation, one day, that Betty’s life would take a totally new direction. “ Did you know that De Havilland’s are taking on war workers?” she asked Betty. “ You can earn a lot of money there,” she continued. After some haggling, the man relented and gave Betty her green card. She went straight back to the Factory and was told to report there the next day. This she did. After a brief interview, she was told to start work there the following Monday at eight a.m.
All the way home, Betty wondered what her family’s reaction would be. “ I got a job at the aircraft factory,” she told her mother. “ I start Monday.” No reaction. Even at teatime, nobody said a thing. Betty felt that SOMETHING should have been said about an event as important as this, but no. She felt like a small ship that was just drifting. Monday morning quickly came and seven a.m. found Betty standing in Fore Street at the bus stop. Three quarters of an hour later, she was walking through the main gates of the Hatfield aircraft factory. As ordered, she reported directly to the personnel office. A group of about six girls were waiting and Betty joined in the introductions. They were a mixed bunch, a hairdresser, a machinist, a nurse and other, equally diverse jobs. They followed him through a maze of corridors, out of the office area and into the factory proper. Betty noticed that, as they got further away from the offices, so the place got gradually noisier and grubbier. It was like going into another world; Betty eyed it all with an air of expectancy. She found a type of friendliness that she had not experienced before. Total strangers were talking as if they were lifelong chums; they all came from totally differing backgrounds but were all there for the same reason. They were issued with overalls and shown to a room where they changed. Betty was horrified. She had been brought up to KNOW the sort of woman that wore trousers, and here she was wearing them herself. Oh well, if it helped the war effort. When they had all changed, they were escorted to the tool stores. They all formed a queue and each, in their turn, was issued with two hammers, one mallet and three files. Betty remembered that, only two short days ago, she had been in a quiet shop, selling frilly, dainty garments. “ What am I supposed to do with these,” she asked, “ Come back when I know you better and I’ll show you,” the storeman replied. Betty now wishes that someone had had a camera. Their faces must have been a picture. Once out on the factory floor, Betty looked around and realised that she knew absolutely nothing about anything that was going on. In her own words, ‘I didn’t know a big ‘A’ from a bull’s foot’. The men all said that it was not right or fair that they should be exposed to such an environment untrained, and the girls agreed. Betty found that MOST of the men were very helpful and did their best to lighten the load. She found that they laughed WITH them and not AT them. They were all shown to their workbenches and put all of their things in the drawer. All meant their coats as well, since the lockers had long since been filled. She spent the first few hours watching someone do the job, occasionally handing tools to the fitter. She found that she understood easily most of what was explained to her. After a while, she was given a job of her own. She was handed a piece of metal and a template. For those who don’t know, a template is a metal silhouette of the finished article. The raw material is clamped to it and cut or filed down to the shape. Sounds easy enough. But then I’ve just explained what has to be done. Betty did not have this luxury. Much later she was stopped, mid file, and scolded. She had taken more off of the template than the job. She didn’t know any better and admits that if she had not been halted, she may have still been there, lustily filing away. Her family asked her how she had got on. “Oh, fine. There’s an awful lot to learn, but it’s interesting.” She neglected to tell them about the template she had destroyed. Nevertheless, her skills improved and she was soon working confidently. Now that she was no longer on the reserved occupation list, Betty found herself ordered to do fire duty. Wartime decisions quite often turned out to be triumphs of enthusiasm over common sense. 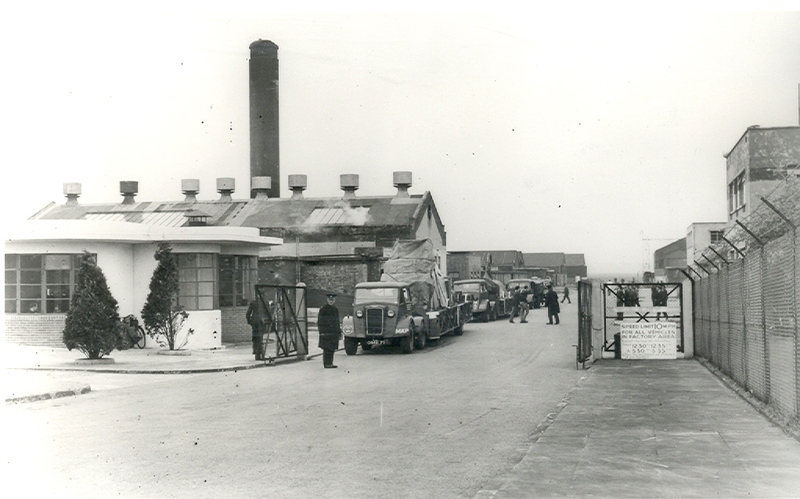 One such typical edict stated that Betty should not only spend all day working in the factory, but spend all night in the Hertford fire station. Betty was rather happy about this; not only did it mean that she would get some sleep occasionally, but it turned out that she was on duty only one Sunday a month. By now, the war was well under way. All thoughts of past lives had faded; the new way slowly fitted better and better. The newspapers, cinema newsreels and radio news all did their bit to keep people informed. They would hear about both the foreign front and the home front. Fellows that Betty had grown up with were going off to war. It all happened with such speed that it took a while for all of it to sink in. On top of this, food rationing came into play. This was the mum’s task and it must be said that they did a wonderful job. People soon learnt to do without things like bananas, chocolate and other things. Christmas in wartime was a very trying time for the wives and mothers. They would have to queue up and save ration coupons for months before. Everyone still had a happy time though, even if the only day off was Christmas day. Everyone did their best to make it so and no one forgot absent members of the family or friends. By now, people realised the gap between war and peace; they were determined not to allow it to widen the distance between themselves and those who were fighting overseas or taken prisoner or worse. Betty remembers the strange feeling she had when she went back to the factory the following day. After the one day of warmth and happiness, she realised that everybody was desperately trying to make things the same as they were in pre-war days. She now knew for certain that those times would never come again. It was all finished, rather like waking from a pleasant dream, and sleep would be a long time coming. The 1940 winter was a particularly severe one. At six forty-five one morning, waiting for her bus, Betty came to a decision. She knew that she was fed up with the cold, the bus ride, getting home after seven and never having any time to herself. She resolved to go into digs. That day, Betty was working at her bench, as usual, and chatting to the girl who worked next to her. She was a young Welsh girl who we will call ‘M’. The conversation turned to the subject of digs. M, said that she wanted to move out of hers and into some that were better and cheaper. Betty immediately told of her decision and it was agreed that they would look for shared accommodation. As M was already living in St. Albans, and St. Albans being a mere three miles from the factory, it was decided to search there first. The girls eventually found just the thing. Clean, pleasant rooms on the Hatfield side of town. The house was in Oakwood drive and belonged to a very nice family called Stray. Mr Stray was a genial man and a bus driver, his wife was an extremely competent housewife. They had a son, Ken, with whom Betty had a ‘pass the time of day’ relationship with, and a younger daughter, Jean. Mr. and Mrs. Stray also had another lodger, a young Jewish girl of about ten called Esther. Betty found her a pleasant girl who joined in easily. Alice and Joe were, at first, wary of the whole idea, but when they realised the difficulties that Betty had to endure, and found Mr and Mrs Stray to be a ‘good family’, they agreed to the move. It was a much-relieved Betty that went to work after that. One day, while Betty and M were working, they heard that people were needed on the Mosquito production line. As they were not exactly thrilled with the work they were getting, they put their names forward. They were surprised to find themselves being sent immediately to that department. They were set to work, building the radiator assemblies for the Mosquito. This aircraft was a fighter/bomber, the description giving a general idea of it’s size and shape. It had two engines of the type fitted to Spitfires. Its timber construction earned it the nickname ‘the wooden wonder’. It was fast, manoeuvrable and was undoubtedly a superior weapon. The radiators were built on a metre square jig. The rad mounting frame was assembled in the jig first, the rad proper being fitted next. When all was bolted up tightly, the jig was removed and the rad was handed over to the fitters. Now, handling this jig was a two-person affair, it being unwieldy. M was put with an old chap called Albert. He was a perfect gentleman. He didn’t like change but he was prepared to accept it for the sake of the war effort. He just quietly got on with his work. The man that Betty worked with, however, was a very talkative person, not at all what she had been used to. He would often spend more time talking that working. He was shop steward, the type of shop steward that gets any union a bad name. He also made it his business to make his views on women in the work-place apparent. He did this by adopting the foulest language that his dirty mouth could utter. He would go wandering for most of the day, returning only to help Betty with the jig. After one particularly nasty tirade, he said to Betty in a loud voice, “You’re not married. I suppose I’ve shocked you”. In a louder voice, Betty replied, “ No, I’m not married, and if they are all like you I never will be.” The man left in a huff, amid muffled laughter. The chargehand came over, he had seen what had occurred. The man was well known for this behaviour. The chargehand told Betty that if he ever did it again she should call him. But someone must have had private and serious words with him because not only did it not happen again, but he actually spent more time on the job. The two men each had their own jig; one did the port rad, while the other did the starboard. On the floor were wooden boxes, each about half a metre high. They were used to stand on when working on the higher parts. The parts to be assembled arrived in large trays that contained the ribs, screws and the like. Lengths of rubber for cushioning and sealing were also present. These would have to be glued into place using ‘Bostik’, a type of strong glue. Betty remembers that the first time she used it, she got more on herself than anything. Easter 1941 came. M asked Betty if she wanted to accompany her on a trip to her hometown in Wales. Betty readily agreed, and after work on the Saturday they set off. They took the late train and arrived at auntie’s house at about two-thirty Sunday morning. Aunty was there to meet them, whether she had stayed up or was just an incredibly early riser Betty never found out. Aunty showed them straight into a bedroom and the girls gladly fell into the softest bed that Betty has ever experienced. Some time later, it was still dark, they were brought breakfast in bed. This they ate and went back to sleep, as they had not been able to doze off on the train. When they finally arose, the girls went out for a walk. M wanted to go to the chapel and talk with some old friends. When they got there, she went inside. Betty stayed outside, she didn’t feel at all at ease. The English and the Welsh have never really got on, there has always been a bit of a culture clash. The Welsh people then, were very insulated. They were withdrawn and intolerant of strangers to the point of rudeness. Betty noticed that the girls walked in clusters, ignoring anyone that they did not recognise. A line from an old song came into Betty’s head; she really did feel like ‘the lonely little petunia in an onion patch’. Contrary to the popularly held belief of the day, the floors of the aircraft works were NOT paved with gold. Betty was only just able to scrape up the fare home. They got back to London in the very early hours of the next day. As absolutely nothing was open, Betty and M could only sit on a bench in the darkened station and wait. Betty was very depressed; for the first time in her life, she was cold, hungry and virtually penniless. They sat in a silence that continued until they were home again. The De Havilland factory had an internal air raid siren that sounded through the speakers of the public address system. A continuous note meant that the enemy planes were headed in their general direction. A rising and falling sound meant that they were in the area of the factory. The third continuous note meant all clear. When the second warning went off, workers were expected to run to the shelters. As these were situated on the perimeter of the airfield, some mile or more away, no one bothered. It was felt that running across a mile of open grassland was too tempting a target for any passing machine gunner. Most employees would shelter beneath the mezzanine floor that made up part of the stores. Because of W.W.1, everyone was afraid of gas attacks. The law stated that you carried your gas mask at all times. In the factory, Betty would have to carry her tin hat as well. The gas masks were strange to look at, indeed, some of the devices the boffins came up with defied description. The gas proof baby cradle looked like an iron lung on wheels. Payday would see huddled groups here and there. All workers received, with their pay packet, two coupons. One for chocolate, the other for cigarettes. Betty would swap her cigarettes with the men for their chocolate, then she would go straight to the sweet shop over the road. Very rarely would she get the proper stuff, she would usually have to make do with bitter tasting truffles. Still, it was better than nothing. After the initial thrill of building warplanes had worn off, Betty found her working life mundane. It was hardly better than the shop work, better paid, yes, but monotonous. The one big advantage of it all, though, was the amount of free time that was suddenly available. Betty found herself doing all sorts of things now. The fitting shop had a darts team and would play local pub teams in the evenings. Betty and M would sometimes go along and watch the match. One of her favourites, however, was just staying in and playing cards. They would normally play pontoon for pennies. She would never, or seldom, win, but who cared? It was fun. The large living room was the scene of many convivial evenings. Almost every imaginable board and card games were played, even dancing to the radio or records. Their circle consisted of Mr Stray, his conductress Helen, Betty, Jean, M, and Mr Stray’s son Ken. They would occasionally be joined by an old scouting friend of Ken’s called Ray. Ray could not attend very often; he worked on the railway and his life was ruled by shift work. Betty found that she regarded most of these as friends. Helen particularly had a good sense of humour. She also liked Ray’s humour and ready wit. As hard as Betty tried, however, she could not teach Ray to dance. Ray tried valiantly but finally gave up, convinced that he had two left feet. Young Esther loved to dance and, until her bedtime, was a junior group member. Esther would be visited by her father on Saturday. He was a hairdresser and had the professionally polite manner about him that a lot of those in his trade seem to develop. Soon after his arrival, he would take Esther to her room. When they later emerged, the girl would be very quiet and withdrawn. Betty thought it was as if she had been given a stern lecture by her father. After he had left, it took the group a while to lift her spirits again. The group would often go out together. A trip to the pictures to see the latest black and white film starring Bernard Miles. Usually about ‘How the milkman won the war’. The most favoured of the pastimes were the walks. These would stretch for miles, across the heath land that would later become Central Drive, down the path that went to the side of the massive cold store. Then across the Hatfield to St. Albans branch line to Colney Heath village. It was on these walks that Betty and Ray realised they were getting to be a little more than friends. It had dawned on them that the others regarded them as a couple. When they realised that they often went to the pictures together, Betty and Ray accepted the fact and they too started to think of themselves as a unit. Ray’s job on the railway was not only shift work but his shifts started at strange times. His working day was not governed by the clock, it was ruled by the railway timetable. They rarely had a whole evening together; it was not unusual for Ray to appear at ten-thirty p.m. They would enjoy a brief hour before parting. And so their life went on pretty much as normal. During the summer of 1944, Betty and Ray had started to talk of marriage. They were both regular churchgoers and both had a strong sense of honour and decency. They realised that their plans had to be brought forward when they found that their love for each other had resulted in a baby. They both knew that marriage was their ONLY option. Ray knew that he earned enough to support them. The old attitudes still existed. Indeed, it was not uncommon for girls in this situation to find themselves sent away to a distant relative. The neighbours would be told that ‘She is looking after an ailing, old aunt.’ After the birth, the baby would be put up for adoption and the girl would return. No mention of ‘HER SHAME’ would ever again be mentioned. Not so with Betty and Ray. They were made of sterner stuff. They both took a lot of flak but remained firm. Ray INSISTED that he would support them all. Betty, for her part, would not even think of giving up the child. As Ray was under twenty-one, he, by law, had to get parental permission to marry. This was, of course, given. Many others were not so lucky. It being wartime, an attitude of ‘live today, die tomorrow’ had started to become common. The whole world seemed to be living on the edge. Everything seemed to be upside down. Many lives were ruined by elders that ‘knew best’ and could not accept that war has a habit of putting old heads on young shoulders. All of the parents took the news with dismay. Ray was berated, loudly and at length. Betty’s parents were stoic and quiet. Both found this time a trial. All agreed to the wedding and arrangements were made. They decided that the 16th of September was to be the day. Ray immediately hit a snag; the vicar of his church would not agree to the wedding date. It seemed that the banns had to be posted for three consecutive Sundays. Ray had missed the deadline by one day. The ceremony was fixed for the same day in Betty’s Baptist church in Hertford. The minister made his views on ‘sin’ very clear indeed. Came the big day. A beautiful service was held in which both the marriage and the future child were blessed. A reception was held at a nearby hotel that belonged to a friend of Joe’s. So began the life of Mr. and Mrs Welch. Betty’s summing up of this phase of her life is that it doesn’t matter too much what you do. It’s how you cope with the consequences of your actions and what you make of your life that really count. It being wartime, a honeymoon as such was not possible. Ray could not get the time off from the railway, and the expense of such a holiday was deemed extravagant. A compromise was reached. The happy pair spent a few days in Hertford, staying with Betty’s family. Ray found that he got on well with everyone. It was finally decided that they would live in St. Albans with Ray’s family for a short time. Sure enough, a few days later, Ray was passing Fleetville post office. He stopped as usual to scan the post cards in the window. One stood out. “ Rooms to let,” it said. Ray took the details and went on his way. The house in which the rooms were was only about a mile from his family home, so that evening they went along. The house was owned by a Mr and Mrs Glasscock; he was a large man who always had a pleasant word. Never a kind word, only a pleasant one. His wife, on the other hand, was a stormy person. Vindictive almost to the point of evil. But these qualities were not obvious at first, so Ray and Betty moved into their first home together. The rent was fixed at thirty shillings a week, one pound fifty pence in today’s money. They gradually got a few bits and pieces together, cups, plates, saucepans and the like. The two rooms that they had were on the first floor, with the kitchen downstairs. Betty found this a very trying time. Being a new housewife was a big enough jump, but doing it in someone else’s house made the task harder. She felt that she had been thrust into it but also that it was typical of her life, always both feet first. It soon became obvious that all was not as it should be. Mr Glasscock answered to his name; his wife thought the name common and rough and would only answer to Mrs Glasgow. She felt that this had a much higher tone. It also became obvious that Mrs G was quick to take advantage of any situation, and indeed any person. Betty, being a young naive girl, was ripe for being put upon. For example, the first time that she took her washing-up down to the sink, she found it already full of Mrs G’s crockery. “You might as well do it all while you’re at it,” she said in a very meaningful voice. Betty did as she was bid; Mrs G was the sort that would make life very difficult if you did not do as you were told. By now autumn was starting to give way to winter. The days took on a chill and the nights got colder. Betty and Ray decided that it was time to get some heat in their rooms. They approached Mr and Mrs G about coal for their fireplace. They both flatly refused, saying that coal was on ration. Betty and Ray even applied to the coal merchant, who told them that they could not help either as the fuel had to come from the house owners. When they returned home, they found that Mrs G had put bent nails over the coal shed door lock to stop any attempt at entry. Luckily, friends and family helped out and they were able to beg and borrow just enough to get by. They found themselves spending the weekends with Betty’s family. Ray’s family would supply some meals and facilities for Betty’s weekly clothes wash. This was one activity that Mrs G did not allow; for some reason it upset her. If she were upset by something, and that was extremely easy to do, she would lock the kitchen door. Many times Betty had to prepare a meal by cooking it in a saucepan on the open fire. She ruined some good pans doing this, some that were wedding presents. At one point Ray cleaned the cooker in an attempt to placate the woman. The gas stove was quite old; it had obviously not been cleaned since it had been built. Ray shovelled vast amounts of grease from it. When he had finished, the flames were twice the size. He need not have bothered, she never even said thank you. It got to the point, just before Christmas, where Betty and Ray complained of their plight to the social worker. In those days, it was common practice for social services to inspect the homes that new babies would be taken to, checking them for suitability. Betty showed a letter that her doctor had written saying, in effect, “OUT NOW.” None of this helped them though as the council did not yet have houses to allocate. Mrs G must have heard about the social worker’s involvement as she became relatively friendly. One day, she knocked on Betty’s door and said, “ Why don’t you come down? We can make a cake each for Christmas.” Betty was pleased, it seemed that at last the woman was trying to be friends. They both used their own ingredients, wartime rationing don’t forget, and Betty was pleased that the first cake she had made turned out beautifully. When iced, it looked lovely. The friendship was short lived; next day, Mrs G said in tones that left no doubt, “I suppose that you’ll be going to your mother’s for Christmas.” The meaning was clear: ‘go away, you are not wanted here’. Christmas Eve saw Betty going to Hertford; Ray joined them later that evening when he had finished work. Christmas Day went well; all enjoyed the cake Betty had made. Boxing Day saw Ray up early. He had to work that day and set off on a very frosty morning to cycle the fifteen miles. Betty was to spend the day with Ray’s family, and so, later, Joe and Alice escorted a heavily pregnant Betty to the bus station. The rest of January was a bitter month. Snow and heavy frost wrought havoc. On Tuesday January 30th 1945, Betty was coming down the stairs when she saw water pouring down the inside wall. A pipe had burst. Mrs G said to Betty, “That water has to be cleared up, and you’ve got to do it.” And so, while a nine months pregnant woman got down onto her knees to clear up water, Mrs G leaned against the kitchen doorpost with a cigarette in her mouth. Later that day Betty’s water broke, no help to be had. Luckily Ray was due home in a couple of hours, so Betty sat down and waited. For a change, the railway had been kind and Ray was home on time. He immediately took Betty to hospital. Wartime, no taxis, no extra money anyway, so they went by bus. Later that day, Betty’s mother, Alice, came over to see her. She was as pleased as could be with the birth of her first grandson. She and Betty had a ‘womanly’ talk. Ray’s mother and one of his sisters also came for a visit. They too were pleased, a boy child to carry on the family name. Normal hospital practice in those days was to keep the new mother in the ward for a fortnight. Betty was to be no exception. The day after the birth, she was moved from the side room, she was put into the large maternity ward, along with five other mums. Betty found this much more congenial. Shortly after, a nurse told Betty that there was another Mrs. Ray Welch in the ward. Betty didn’t think too much about this until later. That evening, they all heard the lady as she started a very difficult birth. The hapless woman went through the night; nobody got much sleep, but all felt sympathy. By breakfast, things had returned to normal. Sometime after the meal had finished, a nurse came into the ward. “ You’ve had a little boy haven’t you?” she asked Betty, with a puzzled look. “Yes,” was the answer. Betty thought for a moment, “You know that there is another Mrs. Ray Welch, don’t you?” The nurse gave Betty a horrified look and dashed from the ward. It turned out that she had been telling ‘phone callers that the other lady had had a boy. Actually, the poor woman had had a stillbirth. Her husband, they found, was a cousin of Ray’s. They both felt for the family. The rest of the two weeks went without a hitch. Toward the end, Betty started to think about taking baby back to their rooms. She found the prospect worrying. Two or three days before she was due to leave, Ray announced that the loveable Mrs. G. had made them give up one of their two rooms. Ray had piled up everything into the one remaining. The reason for this was never made clear, but the rent went down to fifteen shillings a week, which was cold comfort. As they were in no position to argue, they just had to lump it. When Betty came home, she was horrified by the lack of space. Mrs G, for her part immediately tried her old tricks, threatening to lock the kitchen door over some imagined slight. “Do that and I’ll call in the doctor and the health people. I’ve got to make bottles for my baby,” said Betty hotly. As this would have made Mrs. G a lot of bad trouble, she let the matter drop. Indeed, her tricks stopped altogether. ‘Score one for our side,’ thought Betty. Events unfold. Things happen. It is the way of things not to stay the same. At about this time a man, Mr. S, became a drinking pal of Mrs.G’s. He lived in a fair sized house, round the corner in Colney Heath Lane. He had lost his wife some time before and lived with most of his ten children. They ranged in age from ten years to a married daughter. It seemed that a few drinks was not all they had been sharing. Mrs.G wanted him to move into the room that she had evicted Ray and Betty from. It transpired that Ray and Mr. S cooked up a plan. They went into St.Albans, to Arnolds the timber merchants who were the landlords of Mr. S’s house. Mr S introduced Ray as his son-in-law, asking if it would be all right for him to take over the tenancy. Much to Ray’s surprise the manager readily accepted the idea. A new rent book was produced with Ray’s name on it and that was that. Mr S unloaded all of his children onto relatives, except the youngest. He was only about ten, and was ‘a sickly child’. Ray and Betty were feeling happy. A three-bedroomed house in a quiet part of town, and all for thirty shillings a week (£1.50). A few days later, they received the keys. Later, on a September day 1945, Betty walked the short distance to the house to have a look round. As she walked up the front path, a little blond-haired boy looked at her. “ This is an unlucky house missis.” Betty looked at his solemn face, “ No,” she replied, “ it isn’t the house, it’s the people in it.” Without a word, the boy walked away. She opened the door. The sight that greeted her was staggering. The whole place was filthy. Very, very filthy. The floor in the bathroom had collapsed under the obviously unused bath, leaving it leaning on the wall. The toilet bowl was a streaky brown colour. The floor in part of the kitchen had also collapsed. This was found to be caused by damp; the airbricks had become blocked by years of muck. What was left of the kitchen floor, looked as if it were a dirt floor. It hadn’t been cleaned for many many years. As if that were not enough, the whole house was infested with mice. But needs must, they had to move in. Mr.G worked at the giant cold store a mile down the road. He arranged for Ray to borrow a four-wheeled hand truck. Ray piled furniture and possessions onto it. Several trips were necessary to complete the move. When Betty’s mother saw the place she wept. She walked round the place with a hankie over her face. Betty and Zena, one of Ray’s sisters, scraped the floors with knives. They removed several bucket loads of dirt. That first night, they slept in the downstairs front room; the bedrooms were still too filthy. Ray had set mousetraps. By morning, he had caught thirteen. When Betty opened the oven door, out jumped four more. The place slowly took shape; they had to do everything as cheaply as possible. Distemper was used to decorate the walls. This is a coloured, chalky substance that is mixed with water. The woodwork was painted. As they were concentrating on the downstairs first, they were still sleeping in the front room. One morning, Ray awoke to find himself covered with insect bites. Bed bugs, feeding on his blood. Ray’s mother insisted that they slept at her house until things had been sorted out. The next night found them sleeping on a different mattress, on a different floor, in a different front room. They finally finished cleaning and re-decorating three months later, just before Christmas. It must be remembered that they had no hot water, only a gas stove and a kettle. Later, Betty would get the luxury of a gas copper. This was a copper vessel, half the size of a dustbin. It stood on four sturdy cast iron legs and had a large gas ring beneath it. The boiling water would be drawn off through a tap near the base. Very handy for washing day and filling the bath. Ray and Betty had to be ingenious at times to achieve decent results with their decorating. The stair carpet, for instance. It was possible to buy, for a few shillings, the sacks that were normally used for sandbags. As these came in a nice shade of blue, dyeing was not necessary. Betty just sewed them together and, ‘hey presto’, one stair carpet. Just before Christmas, two of Mr. S’s girls came round to collect their letters. “Isn’t it clean?” they whispered to each other. Betty smiled to herself. And so, on a sunny morning, in the back room of their own house, Ray and Betty had their first Christmas by themselves. By this time, the downstairs was decorated. Ray soon made a start on the upper floor, using what materials he could obtain. Only a few months had passed since the end of the war, and most things were still on ration. Most traders had little or no stock, and the grapevine would alert the wise to a shop that had received a supply of anything useful. Occasionally, a friend or neighbour would tell Ray or Betty that he had no further use for a particular item and if they wanted it, O.K. Betty’s father, Joe, was to be a godsend when he provided enough wallpaper to decorate the stairway. By now, Derek was big enough to sleep in a cot. Ray’s mother, Ethel, brought one round. It was made of iron and painted a dark shade of green. Ray and all of his sisters had been raised in it. Derek carried on the tradition. There being only a few local shops nearby, Betty and Ray would walk the two and a half miles into St. Albans town centre where the larger shops were. They would often deviate from the most direct route and walk along London Road to allow little Derek to gurgle and coo at the animals in the pet shop window. On this particular day, the window was filled with puppies. Derek was overjoyed; he pointed at one that caught his eye. Betty and Ray conferred; they decided that a family pet was now in order. They purchased the pup Derek had spotted and took it home. It was duly named ‘Toby’ for the very good reason that this was one of the few words Derek could say. He, for some reason decided that this was the pup’s name and refused to call it anything else, so Toby it was. Ray and Betty found that they got on well with their neighbours. On one side were Mr and Mrs Pearce, on the other lived Mr and Mrs Lowe. On the other side of them lived another family of Mr and Mrs Welch. Wally and Alice were no relation but soon became friends. They had two daughters, Sheila and Ann, who was only a little older that Derek. Early in 1946, Mollie and Zena, two of Ray’s sisters, came to call. During the war, Mollie had met and married Lionel, a sergeant in the army. Now that he was to be de-mobbed, they were looking for a place to live while they sorted themselves out. Lionel was to return to his old job with the North Metropolitan Electricity Company, or the North Met as it was more commonly called. The law stated that any man that had been conscripted into active service had the right to have his job held open for him. Lionel was to spend his working life with the company, later taken over by the Eastern Electricity board. Many men were not so lucky. The horrors of war had left a lot of men traumatised, they would drift around from job to job, never being able to settle back into civvy life. As a gesture of thanks, Lionel installed two electric plug sockets, one upstairs and the other down. Soon after they moved in, Mollie found she was pregnant and, in July, little Susan was born. The couple found themselves in a similar position to the one Ray and Betty had been in. A new baby, and living in two rooms. It was decided that they would live with Lionel’s grandmother, she having a large house to herself. The winter of 47-48 was one of the worst on record. It became known as ‘the big freeze’ and dragged on for what seemed like for ever. It was so bad that even the railways came to a virtual standstill. Coal, which was already rationed, became very scarce indeed. It wasn’t long before power stations began to run out of fuel. Power cuts began to interrupt normal life. Betty found herself lucky in this respect; her house was on the same supply as the nearby Hill End Hospital. The people that were in this situation were supposed to limit their power usage, only using the larger items at certain times. With a young child around the home, Betty found herself reluctant to switch off her electric fire at all. When the freeze ended, the nation was faced with the inevitable flooding problems. Ray, working on the railway, would often have to work massively long hours in an attempt to re-stock all of the depleted coal stocks. At about this time, Betty became friendly with Mrs Una Harris, and Derek was the reason. Little Derek would stand on a chair in the front room, looking out of the window watching the world go by. Most days, a woman would walk past with her little son. Derek would wave, they would both wave back. Very soon, Betty and the lady became nodding friends. One sunny day, she knocked at Betty’s door. “ Hello,” she said, “ My name is Una, I was wondering if your little boy would like to play with my son John.” Thus began three friendships, Derek and John, Una and Betty, Ray and Una’s husband, George. More lodgers appeared, this time the daughter of a neighbour and her husband. Their names were Yvonne and Con, with their little boy, Johnny. They were waiting for a council house and needed somewhere to live for a few months. Con had bad chest trouble. He had spent most of the war as a prisoner of the Germans. He had been forced to work down the salt mines in dreadful conditions; it had wrecked his health. Although having a bad chest, Con had managed to retain his beautiful singing voice. He could often be found in the small pub in Smallford called ‘The Four Horseshoes’ singing and playing his accordion. The couple only stayed for six months, after which the council allotted them a pre-fab in the Cottonmill area. Ray offered the two back rooms of his and Betty’s house. The offer was taken with gratitude, and Betty found herself going to the wedding of Pam and Jack English. After the war, Jack had settled into a job on the maintenance staff at Hill End Hospital. He had been assured that a house went with the job, so he and his wife were waiting. He hadn’t been living with Betty and Ray for long when he was given an old corrugated iron shed. It was carried round to the house by hospital patients. Jack had arranged it so that the blind patients were at the rear. He and Ray erected it in the garden. Ray noticed that his football knee injury began to hurt quite badly. After a while, Pam and Jack were allotted the hospital house they had waited for. After they had moved out, Betty and Ray decided that enough was enough. They would never have another lodger. They decided that it was time to have the house to themselves. Christmas 1949 came, and it was time for little Derek and his friend John to start school. Betty and Una went to the little school in Camp Road and talked with the head mistress, Miss Goldsmith. As the boys were not quite five, she was reluctant to take them on. At first, she insisted that the classes were full, and that the children would have to be taken elsewhere. The other local schools were much too far away so Betty put her foot down. “I have already walked a mile and a half to get here, so have the children. They have GOT to go to this school.” Gradually, Miss Goldsmith was worn down until she finally relented. The day came Betty took her little boy to school and left him. She knew that he would be in safe hands, so that side of things didn’t worry her. When she got home, however, the house seemed quiet, empty. Betty recalls it as a very strange feeling. Later that same day, she went to pick Derek up. She found that he had enjoyed himself. He even stood in the middle of the road and recited a poem he had learnt. “I’m a little teapot short and stout” etc. The first family holiday arrived. The railway stated that Ray was allowed to take the last week in May and the fist week in June as his annual holiday. Mrs Welch, their neighbour, had a friend who owned a chalet in the seaside resort of Jaywick. It was to cost them £3/10/0 per week, £7 in total. A princely sum then. Ray got a free pass from the railway and, after a bus ride from Clacton station, they arrived. The weather was good for the whole fortnight, although it was noticed that the cafe that supplied the good meal they ate the first week had halved the portions by the second. Prices went up as well. They all enjoyed themselves and returned home, with life quickly returning to normal. It was at this point that the interviews reached the period of Betty’s father’s death. He suffered a rather protracted end, afflicted as he was with cancer. It quickly became obvious that this event had had a profound effect on my mother. I was unable to get her to carry the story further. I can, however, give a brief synopsis of later events. Betty continued to live in the same house with Ray, giving birth to a daughter, Janet, in 1957. She came to realise that this type of ordinary, safe normality was all she had ever wanted from life. She continued to enjoy life until her peaceful death at the age of 89. Reading this in December 2018, was very interesting life story about your Mother. Many thanks for a moving story about a remarkable ladies life. The times described seemed tougher than today but people did seem happier.